Rock & Roll Hall of Famer Sammy Hagar today announced plans to throw a free concert at his legendary Cabo Wabo Cantina in Los Cabos, Mexico on New Years Eve. 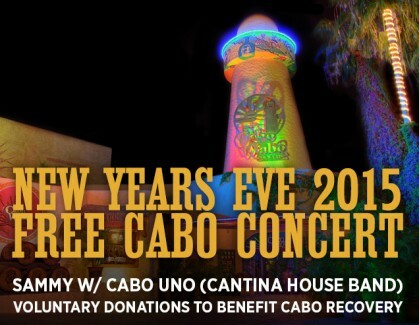 Hagar, accompanied by Cabo Uno, the Cantina’s house band, will ring in the New Year in the town which has much to celebrate since recovering from the aftereffects of Hurricane Odile. In place of tickets, the concert will be a throwback to the early days of the famed club - with admission being free of charge and reservations taken on a first come, first serve basis via email at webmaster@cabowabocantina.com. Fans can also make dinner reservations at the Cantina and stay for the show. In place of purchasing tickets, everyone is encouraged to contribute to the community via a voluntary donation box that will be placed at the main Cantina entrance. Proceeds will be donated to “Los Cabos Children’s Foundation Odile Relief Fund”. Hagar and the Cabo Wabo Cantina are working closely with Ruben Reachi, Secretary of Tourism for Baja California and the Cabo Bureau of Tourism to organize a music festival in early 2015. More information will be revealed in later months and fans are encouraged to visit Redrocker.com for updated information. Great show! Toby Keith also showed up and tore it up. 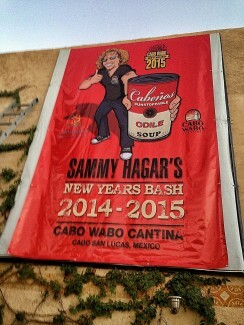 Anyone have three extra tickets for the New Year's Eve Show in Cabo. Just no saw this about the show. Webmaster said sold out. We was going to nye party but after we thought we had dinner and concert tickets they sent us a email saying they were sold out. They had asked for our credit card info and names. Disappointed with online reservations. Been a fan a long time. I've never been to Cabo for NYE - is it like the birthday bash and very casual(dress) or do people actually dress up in ca bo for NYE? Yust want to know what to pack. Yes! It's been too many years since Sammy played in Cabo for NY. My whole family is coming!